My Kindle is my best friend. There I said it. And if you’re like me then chances are you want to soak up every ounce of knowledge you can when it comes to the topics you love. Books are a great source for that, and expanding your interests to the furthest corners of the industry will only help you become a more well-rounded learner. Whether you’re an expert in cyber security or just getting started, hearing the story behind why your skills are needed is just as valuable as learning those skills. So, I’ve done the dirty work for you. I put down Harry Potter just long enough to scour the internet to put together this book list. (And just in time for you to write your wish list to Santa). This is a compilation of some of the best of the best in writing on cyber crime which will have you on the edge of your seat, but also reinforce why your current or future job is so dang important. 1. 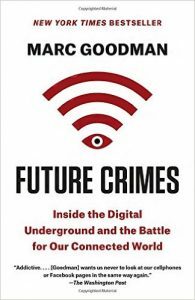 Future Crimes: Inside the Digital Underground and the Battle for our Connected World by Marc Goodman. Through his career in law enforcement and counter terrorism, Goodman takes readers to the darkest parts of the Internet and provides and urgent call to action about how we can take back control of our devices. 2. 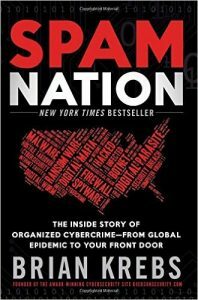 Spam Nation: The Inside Story of Organized Cybercrime- from Global Epidemic to Your Front Door by Brian Krebs. Krebs, a cybersecurity expert and investigative journalist provides a terrifying true story through research, reporting, and interviews. In doing so, he unmasks criminal masterminds driving the biggest spam/hacker operations. 3. 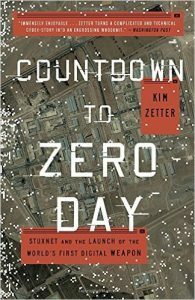 Countdown to Zero Day: Stuxnet and the Launch of the World’s First Digital Weapon by Kim Zetter. Top cybersecurity journalist Zetter shares the tale behind the virus that sabotaged Iran’s nuclear efforts. Now its existence has ushered in a new age of warfare—one where a cyber-attack can have the same destructive capability as a megaton bomb. 4. 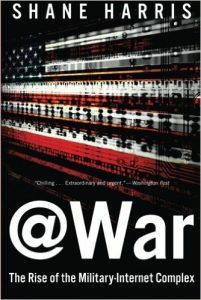 @War: The Rise of the Military-Internet Complex by Shane Harris. Shane Harris offers a glimpse into the partnership between tech giants and the government as they collect vast amounts of information as The United States military currently views cyberspace as the “fifth domain” of warfare. 5. 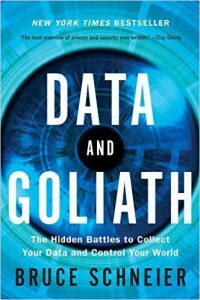 Data and Goliath: The Hidden Battles to Collect Your Data and Control Your World by Bruce Schneier. In Data and Goliath, security expert Schneier offers a path that values both security and privacy. Along this path, readers are shown exactly what we can do to reform government surveillance programs, shake up surveillance-based business models, and protect our individual privacy. 6. Hacker, Hoaxer, Whistleblower, Spy: The Many Faces of Anonymous by Gabriella Coleman. 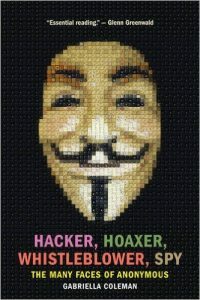 Anthropologist Coleman set out to study the worldwide movement of hackers, pranksters, and activists that operates under the non-name Anonymous whereby she became closed connected to Anonymous just as some of its members were turning to political protest and dangerous disruption. 7. 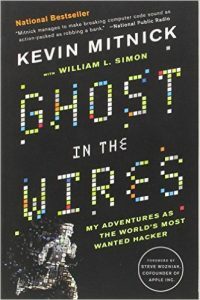 Ghost in the Wires: My Adventures as the World’s Most Wanted Hacker by Kevin Mitnick. Learn from the master himself, Kevin Mitnick, the most elusive computer break-in artist in history as he accessed computers and networks at the world’s biggest companies. Once you have a bookshelf or Kindle library full, keep on the ‘education train’ and get started on a skill certification. You can browse Cybrary’s skill certification catalog. And, for even more great reading, here’s another book list from 0P3N for your enjoyment.